Kennebunkport, Maine. 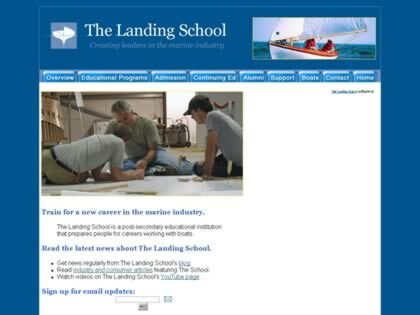 The Landing School is a post-secondary educational institution that prepares people for careers working with boats. The School’s mission is to provide educational programs that effectively prepare students for entry-level careers in the marine industry. The Landing School offers full-time programs of education in Wooden Boat Building, Composite Boat Building, Yacht Design and Marine Systems which run from September through June. Web Site Snapshot: If available, above is a snapshot of the The Landing School web site at http://www.thelandingschool.org as it appeared when this site was added to the directory or last verified. Please Note that Boat Design Net has no involvement with the above web site; all content and images depicted in the above thumbnail are the property and copyright of The Landing School unless otherwise noted on that site. Description: Kennebunkport, Maine. The Landing School is a post-secondary educational institution that prepares people for careers working with boats. The School’s mission is to provide educational programs that effectively prepare students for entry-level careers in the marine industry. The Landing School offers full-time programs of education in Wooden Boat Building, Composite Boat Building, Yacht Design and Marine Systems which run from September through June.